"Help! I formatted the Micro SD card on my Samsung Galaxy phone by mistake. Then I lost all files on it. What's the worse, I have no backup. Do you know how to recover lost data from Samsung Micro SD card? Please do me a favor. Thanks a lot." After formatting the Micro SD card, you will lose the entire data on it. If you haven't kept a backup, you have to turn to a professional data recovery program to restore deleted files from SD card of Samsung phone. And before that, you'd better stop importing new data to the SD card until you successfully regain lost ones, which aims to prevent your deleted files from being overwritten by new data. 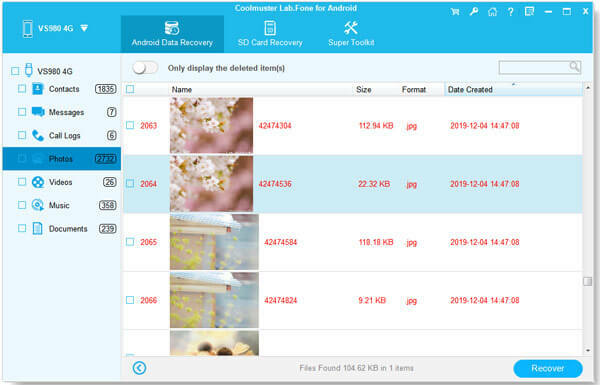 Then I'll introduce you the most effective tool to help recover lost data from Samsung Micro SD card - Coolmuster Samsung SD Card Recovery for S9+/S9/S8+/S8/S7/S6/S5/S4/Note 8/Note 7/Note 5 and etc..
By running this program, all lost data on the SD card can be scanned and arranged on the menu with details. Then you are able to preview them before restoration. Apart from this, Samsung SD Card Recovery also allows you to selectively mark lost files to regain according to your own needs. After picking out needed data, you can retrieve them in a batch. It's pretty user-friendly, isn't it? Now you can download the free trial version to have a try. The following guide will teach you how to recover lost photos, videos, music and documents on the SD card of Samsung phone with simple operations. First of all, download and install the right version of Samsung SD Card Recovery on your computer. Then double click to open it. In this step, you should connect your Samsung smart phone to the computer via a USB cable. In order to get your mobile phone detected by this program smoothly, please open USB debugging and USB storage on your phone. After that, touch the "Refresh" icon on the menu interface, your Samsung device will be detected soon. By the way, if you need to recover lost contacts and messages with this program, you should root your phone first. After detecting your Samsung mobile phone, this program will thoroughly scan it. Soon the lost files will be arranged on the menu after scanning. Now you can touch the options to preview deleted photos, videos, music, etc. Then mark your lost files and hit the "Recover" button to restore them in a batch. What's more, if you have rooted your Samsung phone, this program will scan the internal memory of your phone after identifying your device. Then you can easily recover lost contacts and text messages with this Coolmuster Samsung SD Card Recovery.